vibrational photothermal imaging. The talk will take place at 2pm in Room 630 of Blackett Laboratory, Prince Consort Road, SW7 2AZ. Michelle Sander is an assistant professor in the Department of Electrical and Computer Engineering at Boston University and an affiliated faculty with the Materials Science and Engineering Division. She is a member of the BU Photonics Center, the BU-BUMC Cancer Center, the Center for Neurophotonics and the BU Nanotechnology Center. She received her PhD in Electrical Engineering from the Massachusetts Institute of Technology in the Optics and Quantum Electronics Group. Previously, she graduated with a German Diploma degree in Electrical Engineering and a Master of Science degree from the Georgia Institute of Technology. 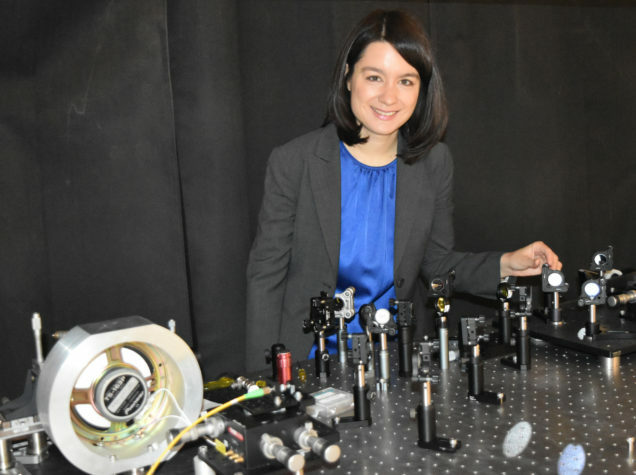 Her research interests include the development of innovative novel ultrafast fiber lasers, characterization of femtosecond dynamics, and applications to vibrational spectroscopy and biomedical imaging. A/Prof. Sander received an AFOSR Young Investigator Award, is the recipient of two BU Dean’s Catalyst Awards and the BU Nanotechnology Innovation Center Award. In 2017, she serves as an OSA Ambassador. Dual-output ultrafast lasers pave a promising pathway towards compact single sources for high precision metrology and dual comb spectroscopy. Based on vector soliton dynamics, a compact fiber laser with co-generated, orthogonally polarized interlaced pulses will be presented. Further, self-organized multiple pulsing operation will be discussed in turn-key, compact thulium fiber lasers. With operation the eye-safe wavelength region from 1.7 µm to 2.2 µm, these femtosecond thulium fiber lasers are attractive for applications in gas/environmental sensing, biomedical diagnosis and surgery and nonlinear conversion. The second part of this talk will focus on mid-infrared vibrational photothermal spectroscopy in the fingerprint region (at wavelengths ~5μm and longer), which can reveal characteristic details about molecular compounds with high sensitivity and specificity. A novel nonlinear photothermal operating regime with characteristic spectral narrowing, bifurcation and strong enhancements will be presented as a new pathway for material characterization. This technique can offer sub-diffraction limited imaging resolution and can be applied to analyze the secondary protein conformations in biomedical tissue. The 3rd Annual London Plasmonics Forum will be held on the 14th of June 2017 at King’s College London. It is open to all researchers and companies in London, UK, Europe and worldwide. Last year’s London Plasmonic Forum was a sell-out event with over 100 participants. This year young researchers (post-docs and PhD students) can apply to present either a poster or give a talk. The keynote speaker will be James Dimmock from Sharp Electronics and his talk will be entitled “Thin metal layers for photodetectors and solar cells”. James is a lead researcher in semiconductor physics at Sharp Laboratories of Europe, where he has spent over 8 years investigating next generation optoelectronic technology. In 2014 he demonstrated a hot carrier photovoltaic cell in a semiconductor structure, based on resonant tunnelling of photogenerated hot electrons. He has recently completed an industrial fellowship at Imperial College London, investigating hot carrier photovoltaic cells with thin film metallic absorbers and their extension for use as photodetectors. Registration is free but please book using the link below for logistical purposes. On the 28th June 2016 Dr Alex Clark and Dr Robert Woodward from the OSA London Local Section joined forces with Mr Henry Hammond, Director of Physics at Alexandra Park School, at the Capital Physics Annual Conference to deliver a Workshop on Optics and Photonics. The aim of this was to train teachers in the use of optics and photonics kits in the classroom, including the OSA Explore Optics Kits. There were many demonstrations from paraxial ray cloaking to Pepper’s Ghost, building a spectrometer and measuring the wavelength of a laser. At the end of the workshop the teachers were all enthusiastic to try out the kits with each of them taking one back to their school. If other teachers want to get involved then please join the local section using the “Join!” tab above. Tomorrow we will have a talk from Dr Jas Sanhera from the US Naval Research Labs in Washington DC. The Naval Research Laboratory in Washington, DC possess facilities for the synthesis of ultrahigh purity chemicals and their conversion into undoped and rare earth/transition metal ion doped glasses, glass ceramics, ceramics, and crystals that can be monolithic bulk optics, thin films, and optical fibers using selective processes such as melting, casting, sintering, sputtering, evaporation, extrusion, and fiber drawing, respectively. The linear and nonlinear optical properties of these materials are then exploited in many applications including laser power delivery, laser power generation, fluorescent sources, chem/bio sensing, and flexible photovoltaics. This talk will focus on the many different optical materials and their applications. Coffees: From 11.00am to 11.30am. Directions: Nearest Tube station: Angel, Northern Line (Bank branch). This years London Plasmonics Forum is at Kings College London on Thursday 9th June. It promises to be an excellent meeting and is FREE to attend! We had the pleasure of hosting Dr Mike Robertson from Huawei (formerly CIP) to discuss the ins and outs of working in the telecommunications and III-V semiconductor industry, of which he has many years experience! We look forward to hosting more exciting talks from industry in 2016. What a great start! We were delighted to host Prof. Donna Strickland, past president of the OSA, in London last month. She gave us a wonderful talk on mid-IR lasers, their possible applications, and some of the rich history behind them. Thanks for coming Donna! We will have a talk from Prof.Donna Strickland on the 13th November from 4pm to 5pm. Refreshments will be served from 3.30pm. Details are below. With the help of nonlinear optics, coherent radiation is produced across the electromagnetic spectrum from X-rays to THz frequencies. However the mid-infrared radiation region, from 5 to 20 µm, known to molecular spectroscopists as the “fingerprint region” still has very few coherent sources, especially at the longer wavelengths. Short pulse systems at these wavelengths are even rarer. Two-color Chirped Pulse Amplification (CPA) laser systems can deliver two intense pulses needed to generate mid-infrared through the nonlinear process of difference frequency mixing. She will describe a two-colour Yb:fiber laser system that we are developing for Long Wavelength Mid-Infrared generation. Prof. Donna Strickland received her B. Eng. Degree in Engineering Physics, from McMaster University in 1981. She graduated from the University of Rochester in 1989 with a Ph.D. in Optics. Along with her PhD supervisor, Dr. Gerard Mourou, Donna Strickland co-invented Chirped Pulse Amplification (CPA), which made it possible to amplify ultra-short pulses to unprecedented levels. From 1988 to 1991, Dr. Strickland was a research associate at the National Research Council of Canada. The following year, she was a physicist with the laser division of Lawrence Livermore National Laboratory. In 1992, she became a member of the technical staff of Princeton’s Advanced Technology Center for Photonics and Opto-electronic Materials. Dr. Strickland joined the physics department of the University of Waterloo as an assistant professor in 1997. At Waterloo, Dr. Strickland’s ultrafast laser group develops high-intensity laser systems for nonlinear optics investigations. She was promoted to Associate Professor in 2002 and since 2007 has been the Associate Chair of the Department. Dr. Strickland was selected as an Alfred P. Sloan Research Fellow in 1998. She received a Premier’s Research Excellence Award in1999 and a Cottrell Scholars Award from Research Corporation in 2000. She is an OSA fellow and served as 2013 OSA president. Currently she serves as a board member of the Canadian Association of Physicists and as an optics editor for the journal, Physics Reports. Coffees: Convocation Suite (in basement) from 3:30 pm to 4 pm. Directions: Nearest Tube station: Angel, Northern Line (Bank branch). Use Entrance shown by a red arrow for Building 5 (Centenary Building) at the junction of Spencer Street and St John Street. Thanks to Prof. Ramachandran and Prof. Agrawal for excellent talks! We recently had the pleasure of hosting Prof. Siddharth Ramachandran (Boston University, USA) and Prof. Govind Agrawal (University of Rochester, USA) who gave excellent talks on research in optics and photonics. Below are a couple of pictures catching them in action! Watch out for updates of our forthcoming talks on the website, and make sure you join the Local Section by clicking the “JOIN!” tab above to receive email invitations. Field Programmable Gate Arrays (FPGAs) are increasingly being used as an implementation platform for embedded vision applications. The structure of FPGAs allows them to exploit spatial and temporal parallelism inherent in many vision algorithms, enabling low power high performance systems to be developed. However, simply porting a software algorithm onto an FPGA often gives disappointing results, because most image processing algorithms have been optimised for a serial processor with monolithic memory. Instead it is necessary to transform the algorithm to efficiently exploit parallelism and the architectural possibilities available on an FPGA, often resulting in completely new algorithms. This will be illustrated with a number of example applications. Donald G Bailey received his B.E. in 1982, and PhD in Electrical and Electronic Engineering in 1985 from the University of Canterbury, New Zealand. From 1985 to 1987, he applied image analysis to the wool and paper industries within New Zealand. From 1987 to 1989 he was a Visiting Research Engineer at University of California at Santa Barbara. He joined Massey University in Palmerston North, New Zealand as Director of the Image Analysis Unit at the end of 1989. He has held several visiting research positions: at the University of Wales in Cardiff in 1996, at University of California at Santa Barbara in 2002, and at Imperial College London in 2008. He is currently an Associate Professor at Massey University in the School of Engineering and Advanced Technology, and is leader of the Image and Signal Processing Research Group.